Blimes and Redinho have shared the visuals for their joint single, ‘Snake Skin Boots’. 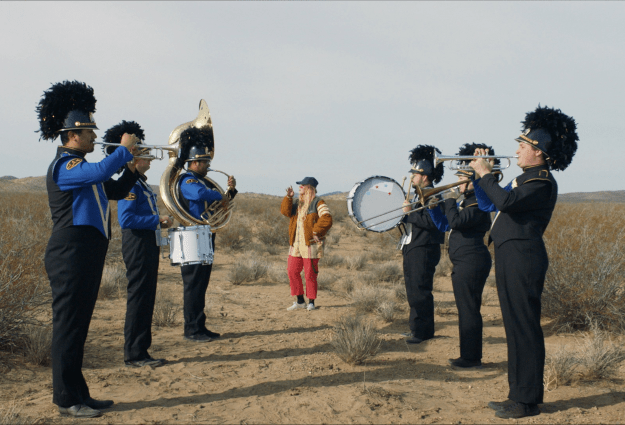 Filmed in a stunning Californian desert and featuring a full marching band, it’s safe to say these visuals embody how much of a hard-hitting, explosive banger the collaboration between the pair is. Check it out below. Bonded over a love for funk, soul and hip hop, Californian rapper Blimes first met multi-instrumentalist Redinho in London whilst on tour. Produced, recorded and mixed by Redinho, ‘Snake Skin Boots’ will feature as the opening track on Blimes new album, Castles. Castles will feature further collaborations with names like Method Man, Reverie, Gifted Gab, and Olivia.Wav.